For those that are working on a political campaign, the day after the election feels like a balloon that suddenly loses all it’s air. Win or lose, the day after is always a time to rest and take stock of what happened. 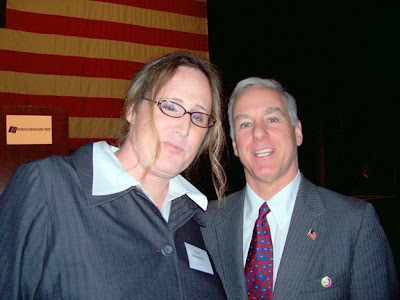 I volunteered with the Obama campaign’s Indiana LGBT Steering Committee. This was the first time I’ve ever felt so inspired by a candidate that I gave my time and effort fully to them. In the midst of working for the Obama team, I really found a passion. In the past politics was something I watched on Sunday morning, much like football fans do. I was a watcher, but not active in it. With this campaign, that changed. But with all the campaign work I’ve done, family events, starting a non-profit, blogging, and all the other things I’ve been doing, Transadvocate has suffered. I’ve been averaging about a post a week on Transadvocate, and that really isn’t fair to my readership or to my sponsors. As of right now, I’m on hiatus from blogging on the main page. This hiatus will last till November. If anyone has a desire to continue blogging the main page, email me marti.abernathey@gmail.com. Most likely, I’m going to run the other Transadvocate bloggers through the front page. Getting Andre Carson, Ken Kern, and Barack Obama elected is my focus for now. We need these equality minded people in office. And transgender people need to work hard to see that they do. I’m putting my money where my mouth is. I’m doing it for me, for my friend Mel, and for her daughter. The next election will be historic in so many ways. We need to be present. We need to be visible. We need to be a part of history. I plan on doing my part and I hope you do too.